Hi I wanted to send a huge heartfelt thank you to Elsa‘s angels! We have received her Muffins Halo and she has been wearing it. It is so nice to not jump out of my skin everytime she bumps into something. This is going to improve her quality of life so much. Thank You just doesn’t seem like enough! Boris is a 10 y.o. Boston Terrier and he is my baby. He is such a cuddler and little love bug. My husband and I fell in love with his quirky personality and the looks he always gave us. He had very expressive eyes and facial expressions that were one of a kind. He lost his first eye due to a very unfortunate circumstance a few years back while playing with a boxer. Her paw caught his eye at just the right spot that we couldn’t save it. He adjusted very well to life and was still just as playful as ever. He recently had surgery to remove his second eye and we don’t even know what happened really. One moment he was fine, the next his lower lid looked like he had a sty on it, and than his whole eye got cloudy within days. We tried to save it but he ended up rupturing something in his eye which resulted in this last surgery. We have three kids who are 9, 7, and 1 and another playful pup. Our house is always filled with noise, activity, and movement. Toph is an 8 week old Sheltie puppy that was born both blind and deaf as a result of poor breeding practices. She was scheduled to be euthanized by the individual that had her but I feel she can have a very full and happy life with our pack. I have two other dogs that she tries to play/interact with but due to her inability to see and hear she tends to run into immovable things such as walls, doors, etc. She wants to be a puppy and play but every time she runs into something it’s apparent that she gets discouraged. She’ll stop playing, retreat, and lay down in one of the four corners of our living room. Toph finds comfort against the walls. I understand that her life is going to be full of obstacles but her family is here to help her get around as many as possible. A Muffin’s Halo will help her be the puppy she’s meant to be. She’s spunky and sweet. If the fear of running into things and hurting herself can be alleviated even in the smallest way it would make a huge difference. Toph is a dog and our family member first, a blind and deaf dog second. She deserves to feel like a well loved member of our family first. Thanks for considering Toph for a Muffin’s Halo today. Aries is a 13 year old Morkie. He started having cataracts a few years ago but when he had a tumour the size of a clementine on his spleen and had it removed, his cataracts progressed immediately after surgery in April 2017. Poor little guy bumps into everything. He loved going in the bush and running after balls. His nose has become great! His activity level has not changed but we have to restrict it because he bumps into everything. He loves playing outside and going for walks. My vet showed me your website and recommended the Muffin’s Halo. Thank You for considering Aries for a donated SCFBD Halo today. 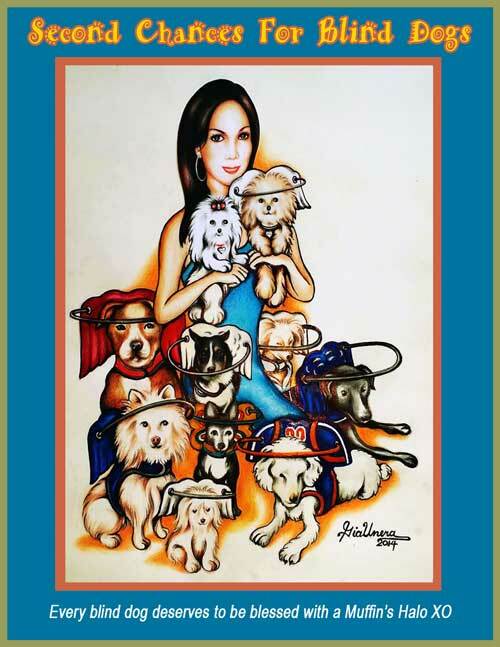 For the Angels at Second Chances For Blind Dogs~ Thank you so much for donating a Muffins Halo for my little Tasia. We’ve been using it for a few days now and she’s starting to get the hang of it. Ellie is a 6 y.o. Pug. She is a happy girl who loves to play with her brother Remy and she loves her snuggle time. Recently, she stopped playing and began bumping into things and having a hard time navigating the house. We discovered that she had suddenly become blind. She has been diagnosed with SARDS (Sudden Acquired Retinal Degeneration Syndrome). She is struggling to adapt to such sudden and profound vision loss. I heard about your organization from a shared FB post. Thank You for considering Ellie for a SCFBD Halo. 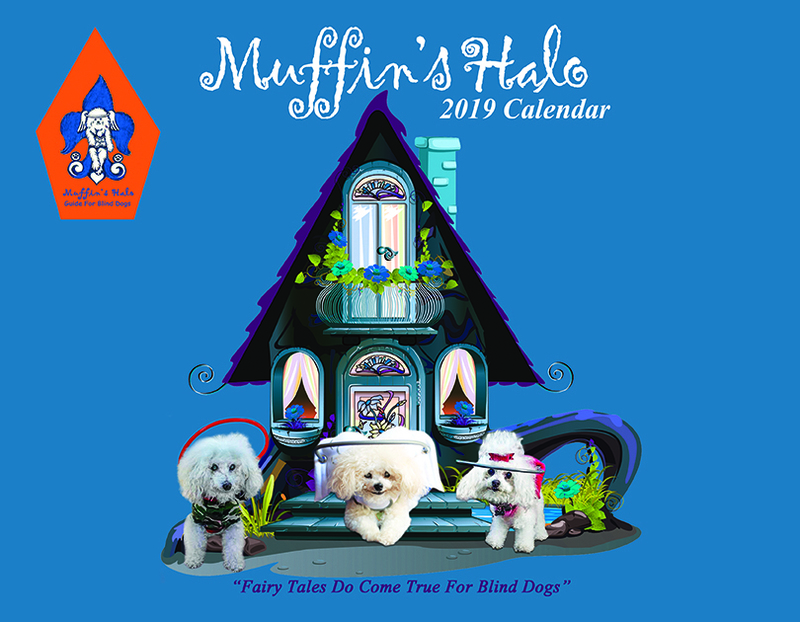 To Second Chances For Blind Dogs, Muffin’s Halo, and my amazing Angel Loraine Harrison: Thank you so very much for my Muffin’s Halo! Getting around the yard and outside has become fun again. I’m happily back to basking in the sun with my sister. As you can see I’m all ready for summer now. My Halo has given me new life and I look forward to everymoment of it. My family say thank you so much for all your help. Simba is an 11 y.o. Chihuahua. He came into my life in 2008. He was given to me by my boyfriend at the time. When the relationship did not work out, he was sent to live with my ex’s brother because it was the best option for him. In May of 2014 while at my mother’s house with my new my boyfriend (who would later become my husband), animal control showed up at my door telling me that they had a Chihuahua in their shelter. Simba’s microchip was still registered to my mother’s house. We were told that if we did not claim him that he would be euthanized because he was deemed a “vicious dog”, so we rushed over to pick him up. We arrived at the shelter to see him cowering in a cage with other larger dogs, and Immediately asked to have him released to us. I was so happy to have him back in my life. However, over the years that we have been apart he developed diabetes, which caused him to start going blind. He requires two insulin shots a day. With the cost of insulin, syringes, prescription dog food, and his glucose test kit, it has been very difficult and expensive to help him with his condition. He has also needed two surgeries for his tooth infections. The tooth infections caused his glucose levels to become very unstable and caused him a lot of pain and discomfort. We tried to reach out to an organization to help pay for his surgeries, but because of his diabetes he was considered too high risk to receive any aid. After two surgeries, he is still alive and kicking. This little guy has so much fight in him even after he has been counted out by everyone else. We don’t have much, but we would give anything to give him the life that he deserves.